With many of the hyper-converged platforms on the market, one of the key propositions is that the value of the solution is around the software, with the hardware being off the shelf basic components available from just about anyone. Since all the high end features are driven exclusively by software, overall improvements in performance should occur with most releases as further optimizations occur. In this particular case, I wanted to put the Choice Nutanix lab gear to the test. I setup a test workload to see the perform delta working through the last year + of major releases. Originally I just threw some pictures on twitter, but that generated follow up conversations on how I arrived at the numbers I did, so I figured a follow up post was worth the time. All the code upgrades completed in < 30 minutes. As each code upgrade causes the CVMs to reboot individually, data redundancy correction needs to occur, and it took < 60 minutes for the extent protection to finish cleaning up. The next major release was in the 3.5 series. This release added a new HTML5 interface, deduplication in flash (as an option), 2012-R2 and vSphere 5.5 suppport, replication compression, and general performance improvements. Post upgrade, the system was up to 975 MB/s at 25K IO/s. I’m not 100% sure, but I believe this was the release where the oplog was spread across both SSDs instead of using just one. The next major release was the 4.0 series. 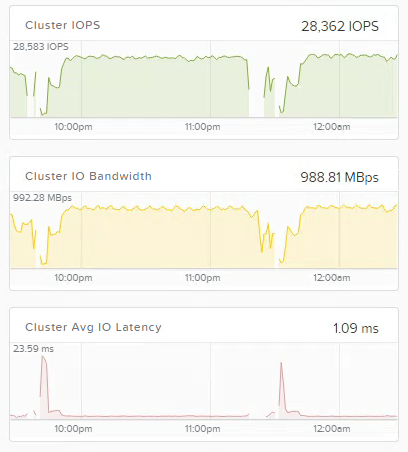 This release added prism-central support, web based code upgrades, block aware data placement, replication factor of 3, capacity tier deduplication (as an option), and beta aws replication. 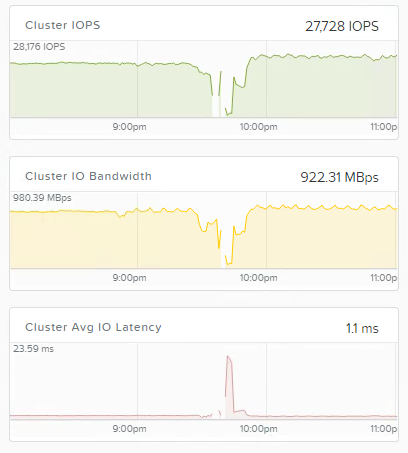 Post upgrade, the speed dropped a little bit, (presumably from additional tracking overhead for one of the new features) down to 24K IO/s and 850 MB/s. The next release was the 4.1 series. The big changes in this was enabling for data encryption at rest, metro availability (synchronous replication), and integrated hypervisor upgrades from PRISM. 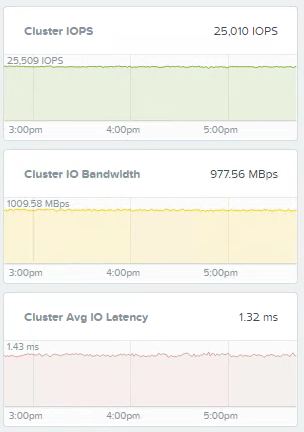 Obviously some efficiency improvements as well, as the workload now reaches 28K IO at 925 MB/s. The current public code at this point is at 4.1.2.1, which is a maintenance release. Performance increased slightly from the general 4.1 code. 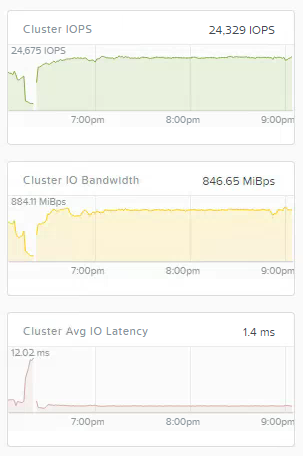 In the end, the same HW physical gear went from generating 17K IO/s and 700 MB/s to 28K IO/s at 950 MB/s+. While I forgot to capture screen shots for proof, the controller vm cpu usage is actually *lower* in NOS 4.1 handling 28K IO/s than in NOS 3.1 at 17K IO/s. Not bad for free upgrades. This entry was posted in Nutanix by Tim. Bookmark the permalink. What about the sa,e test repeated with 4.6? I haven’t personally tried them, a good chunk of customers are seeing 2x boost over <= 4.5, especially for certain IO patterns.